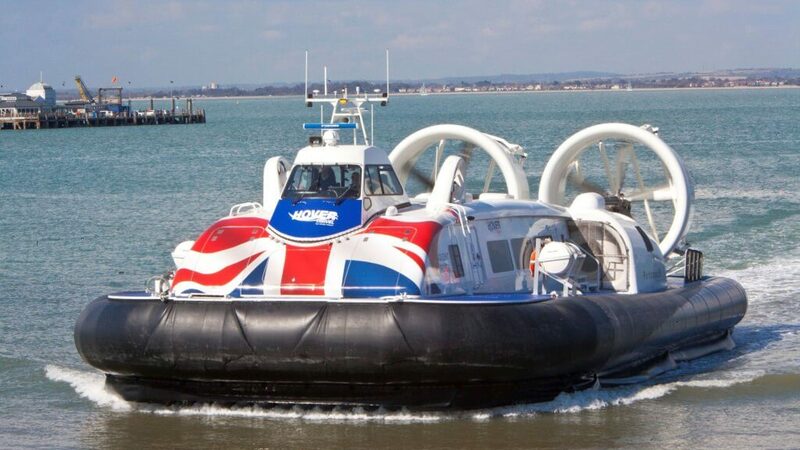 Griffon Hoverwork, the world’s largest hovercraft manufacturer, had just started work on possibly their most ambitious design ever – the 12000TD, an 80 seater passenger craft that would provide a link between Portsmouth and the Isle of Wight. 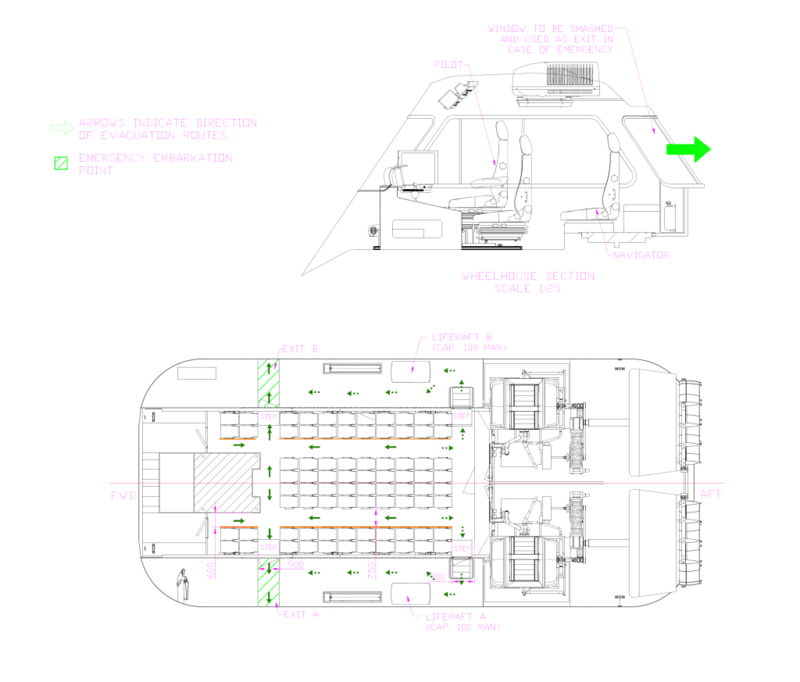 As a Detail Designer working mainly on the passenger cabin, I had the rare experience of seeing my designs immediately made and fitted into the craft. All images posted with permission. However, some information may be omitted for confidentiality reasons. The service bay bulkhead was a partitioning wall that separated the passenger cabin from the service bay (a section used to store electrical and safety equipment). 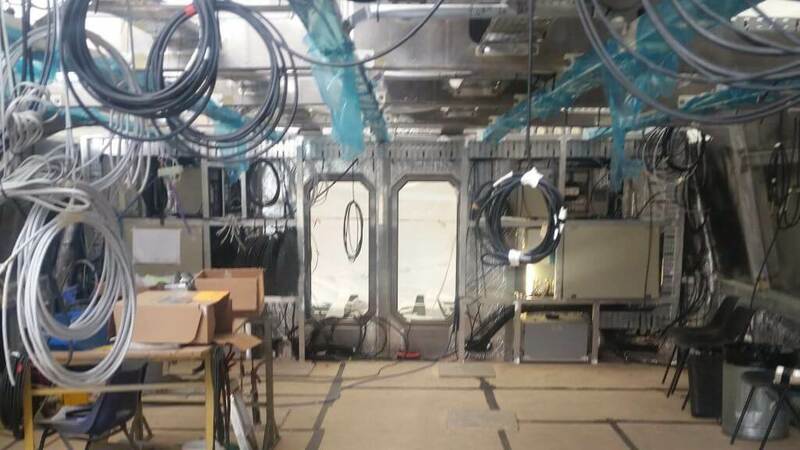 In other craft, this was a series of vertical aluminium sheets welded together to form a wall, but due to the bay’s limited space (a depth of only 60cm), a solution was required that gave access to the equipment without having to go inside. The challenge was to create a light bulkhead that gave easy access to equipment, while also looking good. 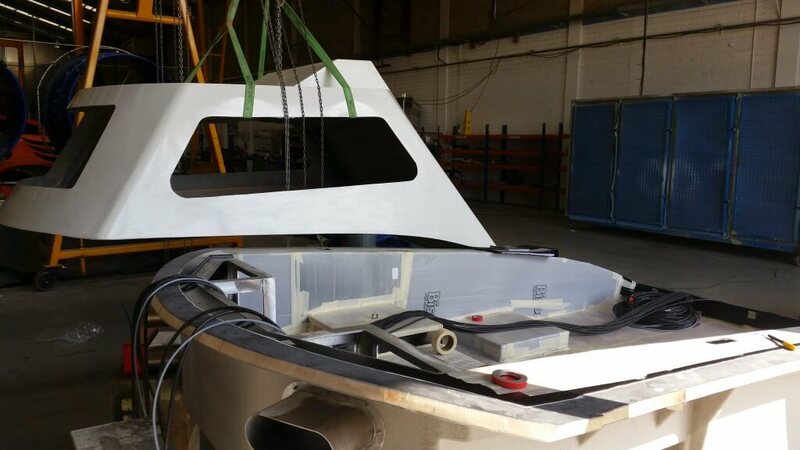 Instead of creating the bulkhead using welded aluminium sheets, a frame would be created from aluminium channel. 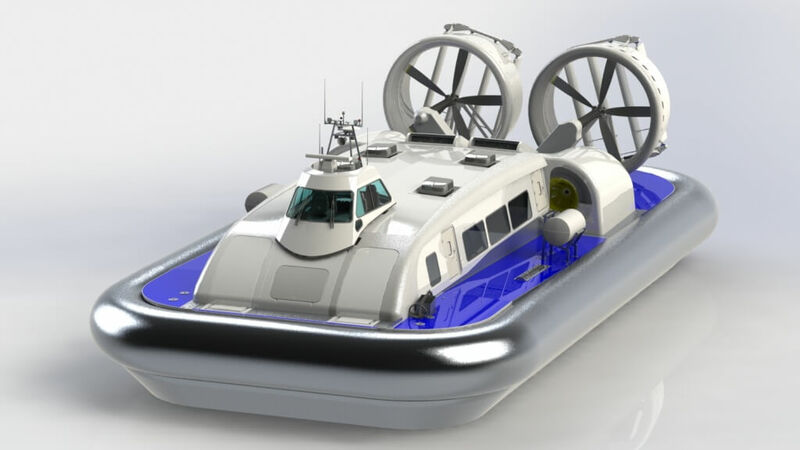 It’d be designed to fit the shape of the craft, and would have several rectangular sections within it for where the equipment was expected to be. From here, hinged doors would be directly attached to the frame, allowing each section to be quickly accessed as needed, with the entire framework being covered with composite paneling (for aesthetics). 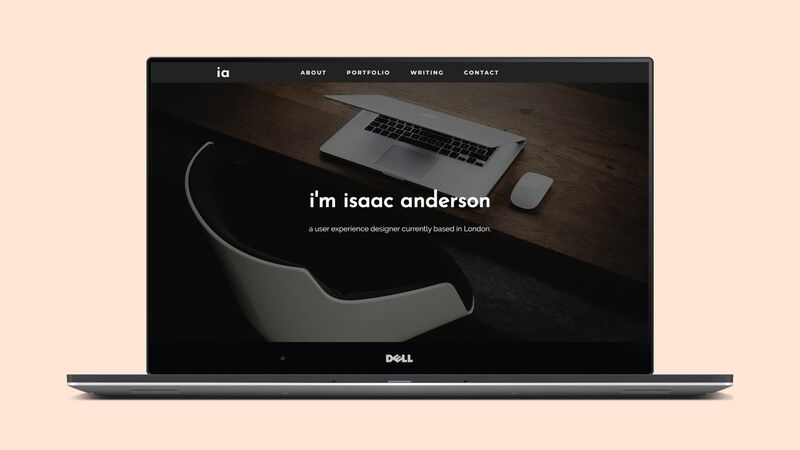 While most of this idea was accepted and integrated into the finished product, small changes were made. 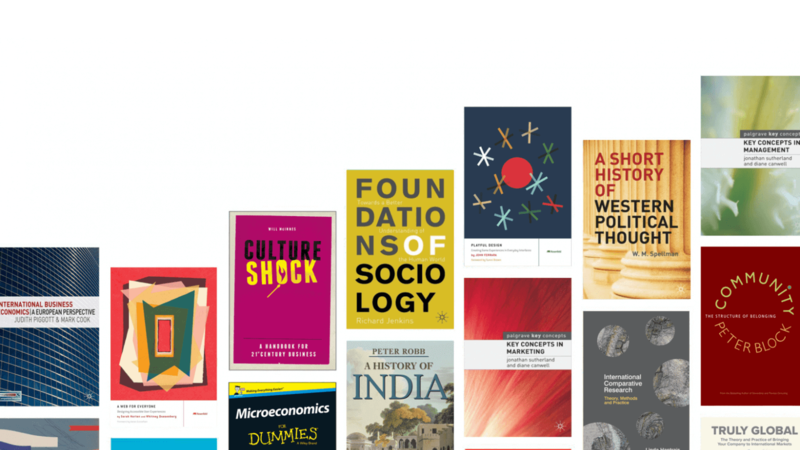 Some sections needed to be accessed more than others, while others needed to be more secure. The compromise reached was that while the doors were needed for areas such as life jackets, panels screwed into the frame would be used for electrical equipment, and drawers used for battery containers. While most of my design work was structural, I did get an opportunity to design parts that would be used by people. The 12000TD was designed with the wheelhouse located at the top of the craft, opposed to previous Griffon craft, which had the wheelhouse at the front. Because of this, the only way to get to the wheelhouse was by climbing a ladder in the main cabin, in front of the majority of passenger seats but in line with the port and starboard exit doors. 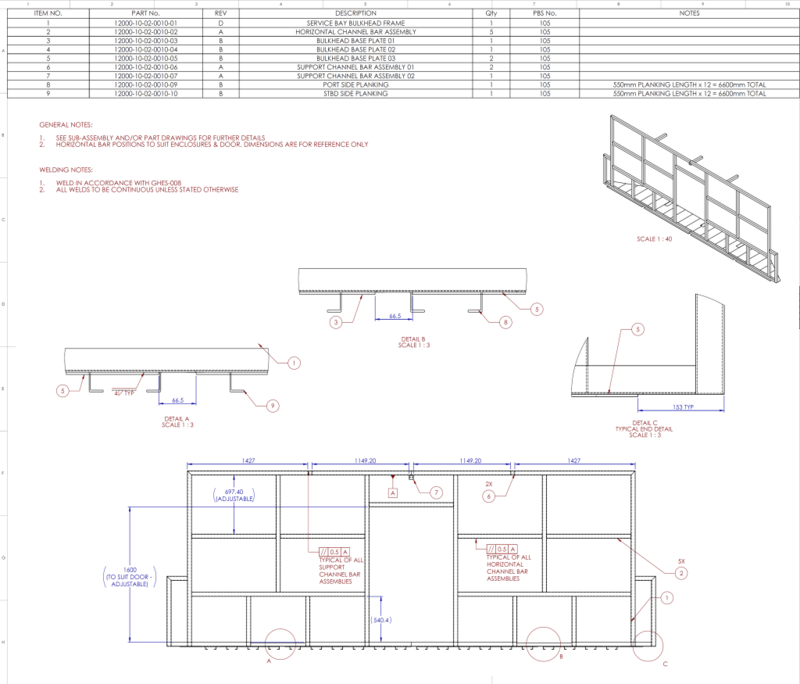 Normally, a ladder would have been brought from an external supplier, but because the height and steep angle required (5° instead of the recommended 15°), a specialist design was needed. The ladder also needed to be securely attached to the floor without bolting, as there was no access to the underside of the cabin floor. While I was able to come with a ladder design fairly quickly, it needed to be as ergonomic as possible. And the bolting issue still didn’t have a solution. I decided to talk to the pilots. By doing this, I was able to find their pain points and adjust the design accordingly. I found out that the soles of the pilots boots are normally damp or wet, and that they wanted a ladder that (unlike previous designs) they wouldn’t slip on. 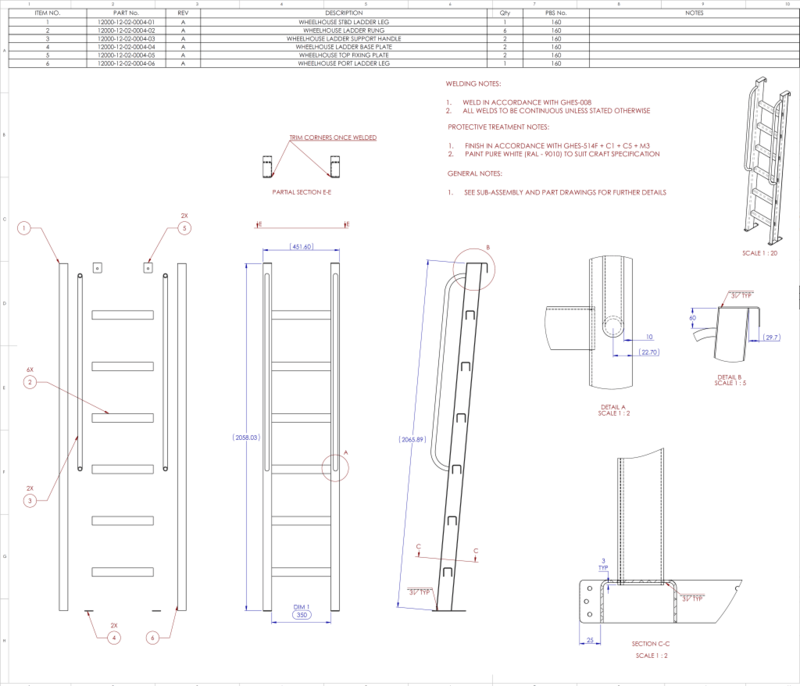 Adding this to the design, I changed the rungs of the ladder from aluminium channel to a folded aluminium treadplate solution. I also added rungs to give the pilots something to hold onto while they were on the ladder. So how was the bolting issue sorted? Well…. it helps when you’re also designing the floor! Its design changed to include “servicing holes” – a series of circular holes at regular intervals that gave access to the underside of the floor. 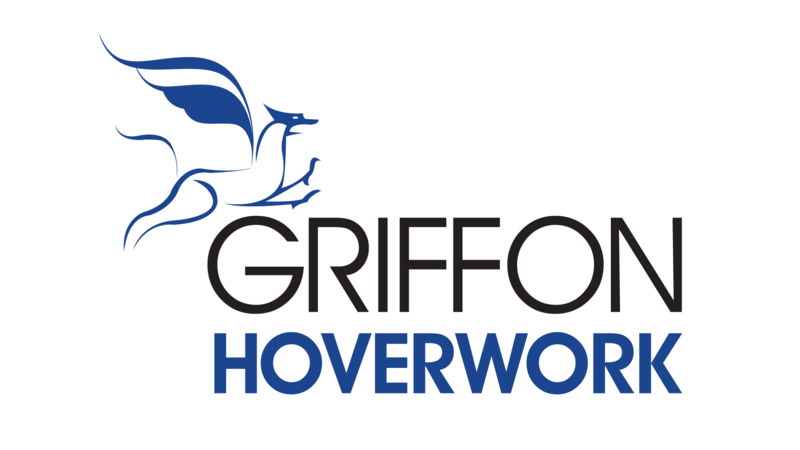 Learning to think about how my design would be made was probably the biggest lesson I learnt at Griffon. Attaching the wheelhouse to the main cabin was one of the biggest jobs in the entire project. It was going to be mounted onto four pillars bolted into the main cabin, and to aid this, four holes were positioned on the wheelhouse. These would later be used to put mounts inside, which in turn would be attached to the pillars. The position of these holes was critical – if they were outside the tolerances given, then the wheelhouse couldn’t be fitted onto the pillars. Therefore, a “jig” was needed to maintain the position of these holes while the wheelhouse fiberglass mold was being made. This jig wasn’t part of the actual craft design. Because of this, and to keep costs down, only stock metal could be used when manufacturing it, which created a multitude of problems regarding strength, stability and height. 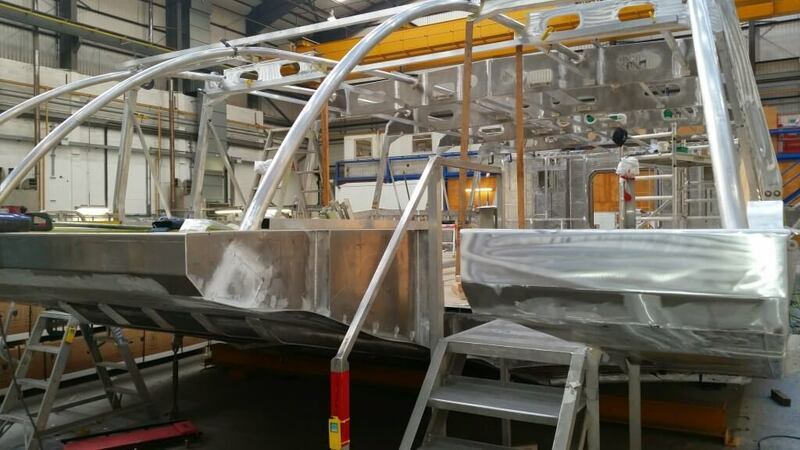 Some of my earliest designs couldn’t be made, leading my mentor to show me the manufacturing processes of both the wheelhouse and various aluminium components. 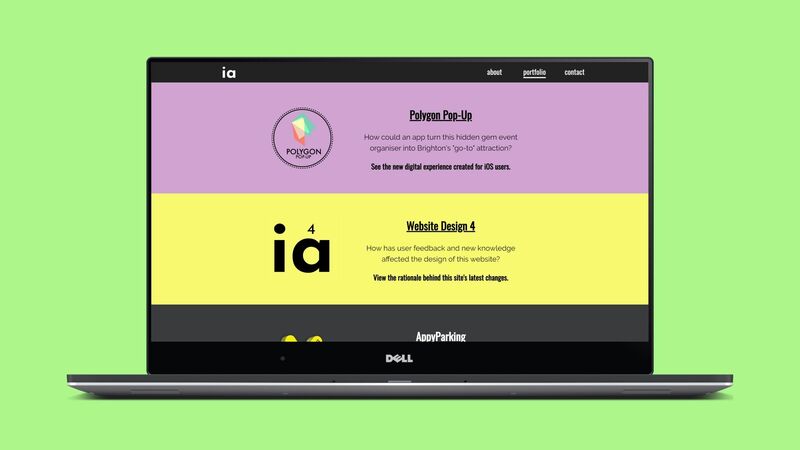 Armed with this knowledge, I started to redesign while constantly thinking how the jig would be made, and ended up rejecting several ideas for a simpler solution. As a passenger craft, safety regulations were a lot more stringent for the 12000TD when compared to other, military based designs. All designs that were related to safety had to be approved by the MCA, who were responsible for implementing British and International maritime law and safety. 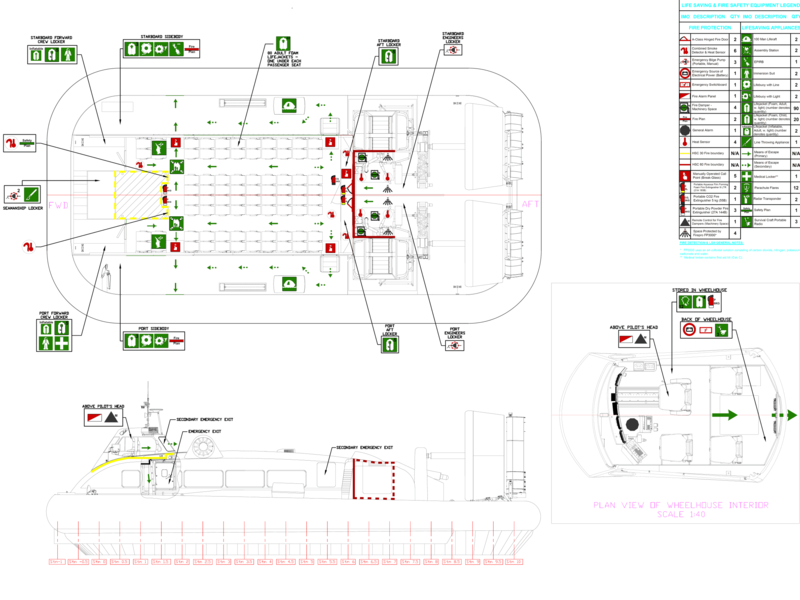 One of the designs the MCA needed to review was the life-saving appliances (LSA) plan. This would show the location of all equipment (fire extinguishers, smoke detectors etc. 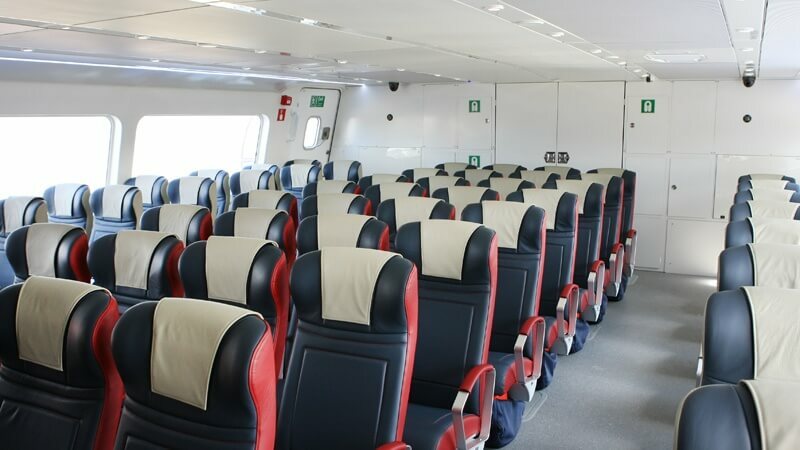 ), and would also be displayed in the passenger cabin, as well as used by the crew. 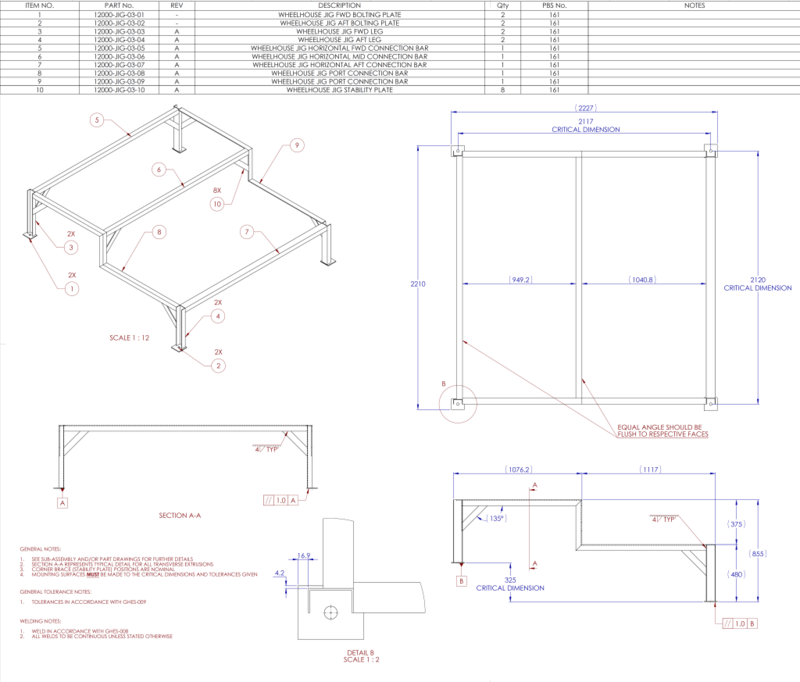 It was also referenced by the Modelling department frequently, as they needed to accurately model and position the equipment included on CAD software. The challenge was to create a plan that didn’t affect the existing design. 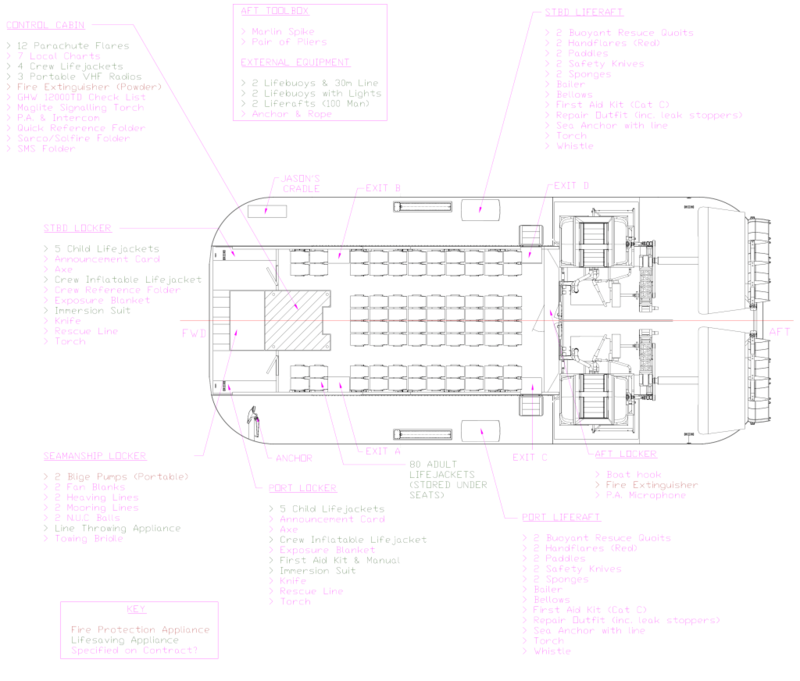 I designed an initial layout that would abide to the rules set by the MCA and Griffon’s internal standards, as well as the HSC and FSS codes. 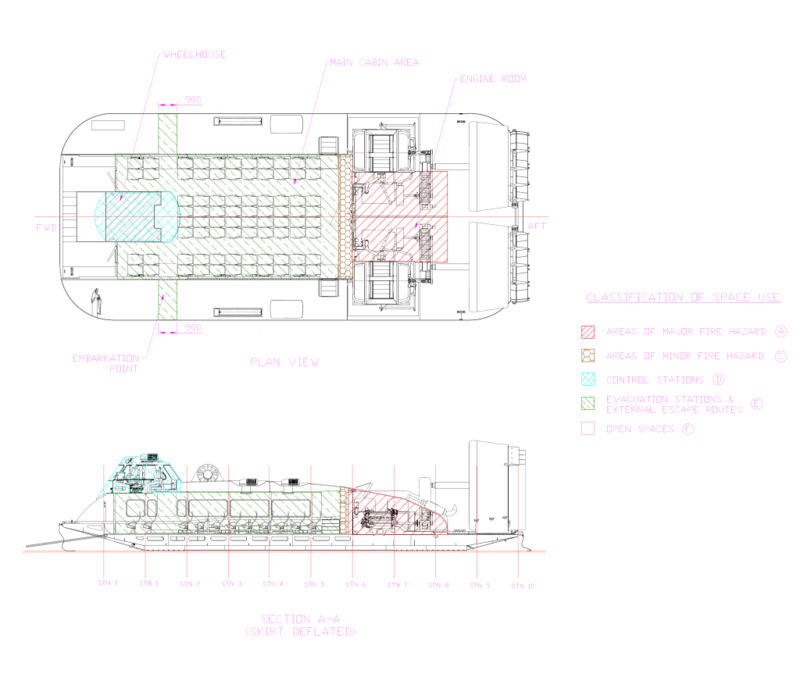 Over the next few weeks, working with the Design Office and Statutory Compliance, as well as referencing previous passenger craft, this plan was optimised to fit around the overall design of the 12000TD. This was later expanded to include an emergency routes, fire zones and an equipment list.